BASEHOR — Love made visible. That was the theme of a homily by Bishop James Conley, of the Diocese of Lincoln, Nebraska, given on Dec. 31 at Holy Angels Church in Basehor. The bishop was on hand at the invitation of pastor Father Richard McDonald, to celebrate the feast of the Holy Family and to help the parish of approximately 700 families launch perpetual adoration. More than 400 gathered for the liturgy and prayers for the parish’s new adoration chapel and its patroness, Mary, Queen of the Angels. Archbishop Joseph F. Naumann will officially dedicate the chapel this spring upon its completion. Known as Our Lady of the Angels Perpetual Adoration Chapel, its design is reminiscent of the chapel of the same name in Assisi (also known as the Portiuncula) where on Aug. 1, 1216, St. Francis received an apparition revealing Christ as King of Heaven and Mary as Queen of Heaven. The completed chapel will feature eight stained-glass windows, statues of St. Frances of Assisi and St. Clare of Assisi, artwork above the tabernacle and entrance, and vintage wooden pews with space for approximately 16 people. 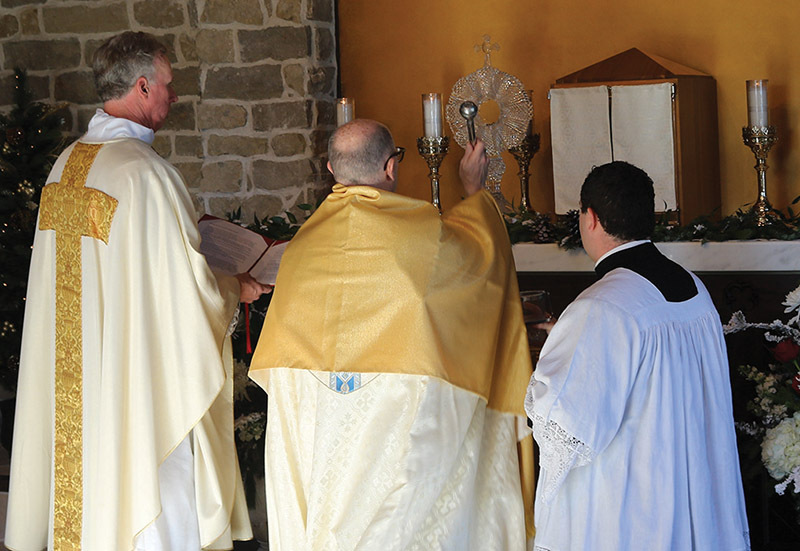 According to Father McDonald, the feast of the Holy Family and the day before the solemnity of Mary, the Holy Mother of God, seemed an appropriate time for the parish to start perpetual adoration. “What better time to do it, we figured, than on the cusp of a new year, inviting people formally to make probably the best New Year’s resolution that one can for one’s spiritual life?” he said. In his general blessing of the newly constructed chapel, Bishop Conley asked for the intercession of Mary and entrusted her to see it through to completion. Father McDonald said he holds great hope for the adoration chapel. “We pray that this adoration prayer chapel may be a gift to all people,” he said, “even those who never darken its threshold, but who benefit from the prayer of those within. According to Bishop Conley, spending time in prayer is critical to restoring family and culture. “This chapel and the prayers that will rise from it will be a tremendous source of grace and blessing for years to come for all of you and your families,” he said. Moreover, he said, eucharistic adoration transforms individual lives. The bishop ended by inviting everyone to sign up for an hour of adoration. “Everyone, no matter what your circumstances, can come before the eucharistic face of Jesus and encounter his love,” he said. Quoting from one of his pastoral letters, the bishop added, “No one needs to be a mystic to kneel before the Lord in adoration. Everyone begins the practice of prayer without knowing much about how to pray.